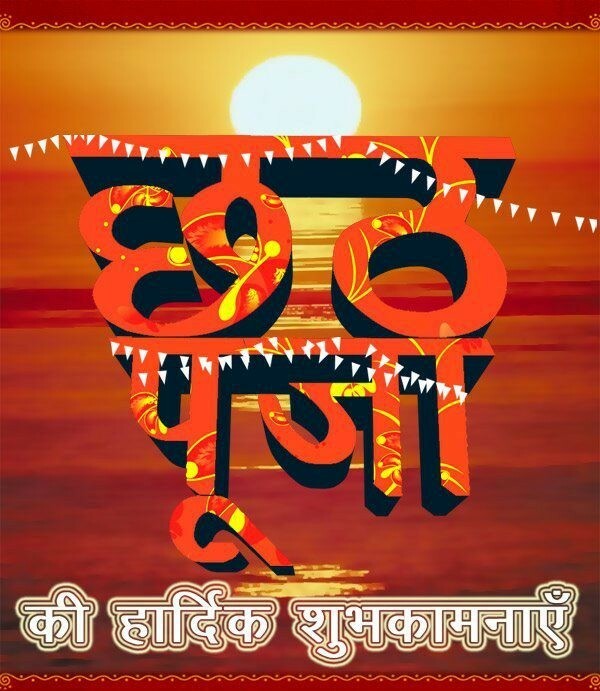 The Sun God, Surya, the god of energy and of the life-force, is worshiped during the Chhath Puja to promote well-being, prosperity and progress.Chhath Puja is also known as Surya Shashti, Chhathi and Dala Chhath.It is a popular Hindu festival celebrated in the northern regions of the India. These regions include Bihar and Uttar Pradesh. Other places where Chhath Puja is observed are Chhattisgarh, Chandigarh, Gujarat, Delhi, Mumbai, Nepal and Mauritius. Chhath is dedicated to Sun God which people believe sustains life on earth. Chhath Puja is also performed to seek blessings from the Sun God to promote prosperity and progress. The festival falls in the month of October or November. The traditional rituals followed by people are quite strenuous in nature and are observed for a period of four days. The customs associated with Chhath Puja include holy bathing, fasting and refraining from even drinking water. It also includes rigorous physical customs like standing in water for extended periods, and offering prayer and Prasad during the sun rise and sunset. Chhath can well be regarded as the state festival of Bihar, where it goes on for four days. Outside of India, Chhath is mainly among celebrated by the Bhojpuri and Maithili speaking community apart from the Nepalese Hindus. It assumes a joyous and colorful form as people dress up in their best clothes and gather by rivers and other water bodies to celebrate Chhath. Many devotees take a holy dip at dawn before preparing the ritual offerings or ‘prasad,’ which mainly comprising ‘Thekua,’ a hard and crude but tasty wheat-based cake usually cooked on traditional earthen ovens called ‘chulhas.’ The divine offerings are placed on circular trays woven out of bamboo strips called ‘dala’ or ‘soop.’ Women adorn new clothes, light lamps and sing devotional folk songs in honor of ‘Chhat Maiya’ or the holy river Ganga. After sunset, devotees return home to celebrate ‘Kosi’ when earthen lamps or ‘diyas’ are lit in the courtyard of the house and kept beneath a bower of sugarcane sticks. Serious devotees maintain a strict anhydrous fast of three days. The origin of Chhath Puja dates back to Vedic times, as Vedic texts contains rituals associated with the worshipping of Sun. It is also believed that Draupadi, from the epic Mahabharata, used to perform similar rituals. Some people also believed that Chhath Puja was started by Son of Surya, Karna from Mahabharata. Chhath Puja is not only religiously significant, but also has several mental and physical benefits. Physically, the practice of Chhath facilitates in improving the immunity of the devotee. It is also believed that light rays emitted by sun are quite beneficial for the normal maintenance of the body. Being antiseptic in nature, the safe radiations from sun can help in curing fungal and bacterial skin infections. Sunlight received during Chhath provide energy that when get combined with blood streams enhances the performance of white blood cells, which further leads to improving fighting power of blood. Nahai Khai- The first day is known as ‘Nahai Khai’ which means Bath & Eat. The ‘Vrati’ or devotees take bath in the sacred river Ganga and take back the holy water to cook offerings (Prasad) at home. Kharna- On the second a complete day fast without water is observed by the devotees. They end their fast after doing the puja in the evening. Offerings or Prasad includes puris (deep-fried puffs of wheat flour) or Rasiao-kheer (rice delicacy). Chapattis and bananas are distributed among family, friends and visitors. Sandhya Arghya or Evening Offering- The third day is also observed with fast without consuming water. The entire day is spent in preparing puja offerings which are made and kept in a tray made out of bamboo. The offerings include Thekua, coconut, banana and other seasonal fruits. The evening rituals are done at the banks of a river or pond or any clean water body. All the devotees assemble and the ‘araghya’ is offered to the setting Sun. Bihaniya Arghya or Morning offerings- As the last day of the auspicious puja, devotees again assemble on the bank of a river or pond to present offerings to the rising Sun. After the offerings are made, devotees break their fast by either eating ginger and sugar or whatever their local tradition holds. According to a belief, after the main Puja on the final day in Chhath Puja, if you beg for the Prasad all your wishes will come true.